The best photo management program, digikam supports geotagging of photos - you can assign special GPS coordinates via EXIF to the image by clicking on a world map. Whenever I get to buy a decent gps tracker, I don't need to tag the images by hand but can sync my images automatically with the log from the tracker. So what to do with geotagged photos? For once, I want to have all the photos of the trip to France displayed in Google Earth - this way you exactly know where you are, which roads you took and such. 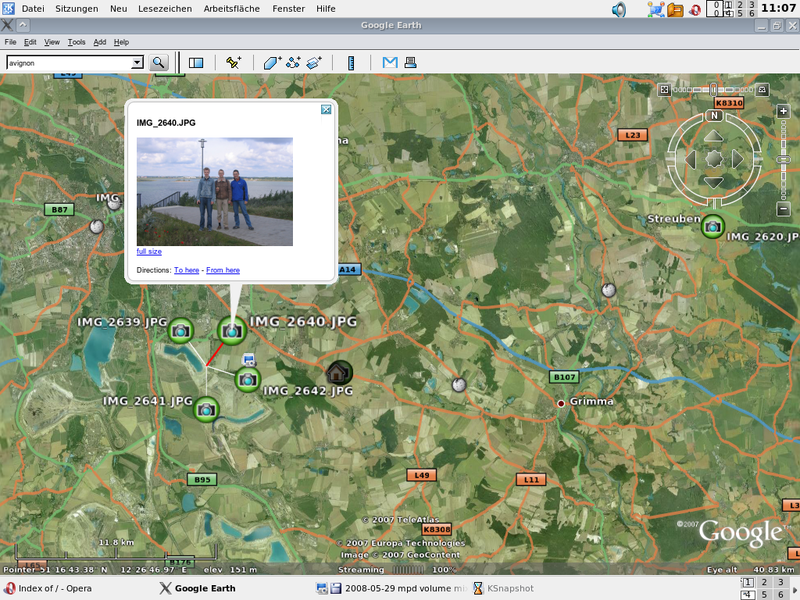 I searched the web for a tool that creates .kml files from a directory of geotagged photos, and finally found it: gps2photo, a perl script for exactly this task. Beside reading the gps coordinates from a tracker file, it also extracts them from an image - what I wanted. At first it didn't work because it didn't recognize my pictures to be geotagged because they didn't contain GpsTime* exif fields, but removing those checks from the source gave me my kml file. The results can be seen on this screenshot.